To those who prefer their clothing brands to be old and storied, Lord Willy’s may sound like a silly name. It is a silly name, and deliberately so – the downtown New York store was founded by Alex and Betty Wilcox to try and bridge the super-serious tailors and the rock ‘n’ roll hipsters. Sartorial but silly, that was the idea. It has become more serious since then. The website, for instance, has just been replaced with something that reflects the seriousness of the new shop. That store makes more of tailoring and tuxedos, and carries the Anthony Cleverley line of shoes. The old store, next door, is to be turned into a boy’s clothing shop. It will be very silly. Everyone has to wear glasses with one tinted, star-shaped lens. So what is there to like in the more serious store? Well, most of the shirts are made to order, in terms of fit. There is a large range of designs, with a distinctive spread collar and trademark coloured buttons, but each order is made to a customer’s specific measurements. On the tailoring side, Lord Willy’s offers ready to wear, made to measure and bespoke. Mostly the first two, but it’s good to highlight the difference. The trousers to all suits are also custom made – the style is for a narrow pant, and as Alex says, it is incredibly hard to find a well-fitting narrow trouser off the rack. Don’t let narrow trousers put you off though. The jackets are not super short; the lapels are not skinny. Alex is fully capable of boring you for hours on how these proportions can be messed up – and how so many designers got it wrong when they copied Thom Browne’s shrunken suit. I’m not a fan of coloured buttons or the larger (blazer-sized) buttons that Lord Willy’s put on its suit jackets. But the quirkiness never goes as far as, say, Paul Smith. The linings are striped, not bright. There are no extra random buttonholes. Elements like grosgrain binding extend all the way round the jacket to the vent: a nice and expensive detail. 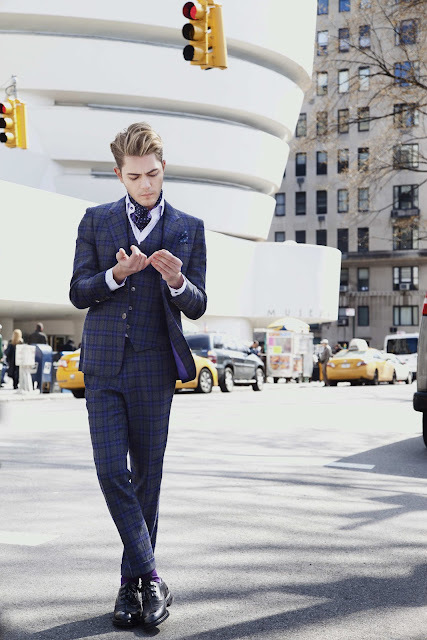 New York has seen a plethora of new shops in recent years trying to do quirky tailoring. Lord Willy’s was there before them and continues to thrive. Worth checking out. You can follow the discussion on Lord Willy’s: the best of the quirky tailors by entering your email address in the box below. You will then receive an email every time a new comment is added. These will also contain a link to a page where you can stop the alerts, and remove all of your related data from the site. What other “quirky” tailors are there? I really like the idea of and occasional colored button? Try Lord Willy’s first. And Miller’s Oath (though more custom and less quirky). There are others (e.g. Sew), but Willy’s is the best I think. Grown men ought not to be silly, like the man-boy in the last picture, wearing a suit three sizes too small. No thank you to Lord Silly’s. Not enough time I’m afraid William. Hopefully next time.